It was Sunday 24th, August 2014, when I met Engr. Javed Majeed; we were waiting for the Think Tank Committee meeting to start. He is also the member of IEP. I took opportunity to interview Engr. Javed, while having tea. I asked him about his family back ground. He started, by saying that my father graduated from Aligarh Muslim University in 1922 and later joined the British Army. He was posted to Pakistan prior to 1947 partition. I was born at PNS Shifa Hospital Karachi. We were four brothers and three sisters and our father ensured that we all get educated and well settled in life. I asked him, about his family size, but as an army man he disclosed directly. that I am married. My wife is MA in English from Sindh University and my father-in-law, Dr Ainudin Ahmad, retired from British Army. 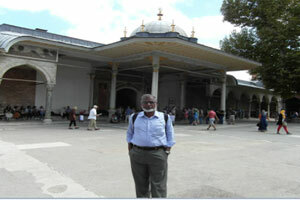 He is a well-known child specialist of Hyderabad. I have a son and a daughter, both married. My son is an Electrical Engineer with Master in Telecom from Denmark and working in Karachi; my daughter lives in UK. My schooling up to secondary level was in Rawalpindi, Matric from Karachi, and Intermediate from Adamjee Science College and Civil Engineering from NED Government Engineering College in 1967. During school and college days I used to play hockey and represented the school and college teams. I was also member of Karachi Boat Club, where I learnt rowing and used to participate in rowing competitions. Later, I was more keen to learn swimming, which I did at Dockyard sea. From early days I was fond of adventurous life, and I chose civil engineering as I actually found it thrilling. My first job was in Associated Consulting Engineers in design section, which I never liked. After a year, I got the opportunity to join WAPDA in Surface Water Hydrology at Rawalpindi. There I toured a lot and visited all the rivers around Rawalpindi, Muree, Kohat, Cambalpore and Attock to measure their discharges and maintain the weather observatories. Though there was no engineering involved in it, the best part was to have a jeep and enjoy the scenic beauty, travelling and staying in rest houses. Within a year, I met with an accident in the mountains of Cambalpore, and had to remain out of action for a month. Upon recovery, I was posted to Hyderabad and then to Karachi. The duties were same but the area changed to Sindh and Balochistan. The thrill was over and it was more of monotonous life and I was getting fed up. After the 1965 war, I was motivated to join Army; again the motivation was the thrill and adventure, which is at its maximum in Army life. But civil engineers get very rare opportunity to join at that level. In 1969 I got the chance to apply as regular commission in Army. I went to Pakistan Military Academy Kakul for training in 1970. After training at PMA Kakul, my career as a soldier started and I was posted to 173 Engineers Battalion for the construction of the Karakoram Highway (KKH) in area where presently Bhasha Dam site is located. I was posted to various stations in different ranks starting from 2nd Lieutenant to Lieutenant Colonel. I served at KKH for a year, going up to Khunjerab Pak-China Border. From there I moved to Risalpur for Basic Course at Military College of Engineering. Afterwards I went to different places such as Lahore border area for lifting of enemy and our own mines. Later I went to Quetta for infantry courses and interior Baluchistan, Sib-Miawand, Sui, Dera Bugti, for road construction, etc. Then I went to Karachi, Dir, Lowari Top, Chitral, Azad-Kashmir, Vehari, Multan, Lahore, Muree, Kahuta, Sialkot and Peshawar on various assignments. In 1984, I went to Saudi Arab on deputation for 1½ years. Peshawar was my last posting station, from where I retired in 1996. 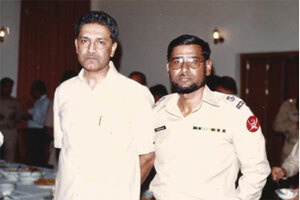 I did various army course as Captain and Major, such as Weapon and Tactics course in Infantry School Quetta, Engineers Basic course and Unit Commanders Course at Military College of Engineering Risalpur, Controlled Blasting Course at Chitral, Water Divining Course at HQ 4 Corps Lahore and Intelligence Staff Course at Intelligence School Ghora-Galli Muree. As Lieutenant Colonel I commanded the Engineers Battalion having strength of 750 soldiers, NCO’s, JCO’s and Officers in Sialkot in 8-Division under General Tanveer Hussain Naqvi and General Ali Kuli Khan. The role of engineers during the defensive battle is to lay mines, demolition, preparing bridges for reserve demolition, creating tank obstacles, inundation of the areas, retard enemy assault etc. Similarly while in offensive role, it is mine breaching of enemy mine fields, construction of assault bridges, facilitate move of own fighting echelons etc. These roles are rehearsed and practiced with troops during the divisional summer and winter collective training exercises in the field. The commanding officer of an engineer’s battalion in the Division is advisor to the Divisional Commander on all engineering matters. I remained on deputation to the Navy for three years as Assistant Garrison Engineer. During service with the Navy, my job was maintenance and construction work in the Cantonments. I worked at Manora and Naval Ammunition Depot in Maripur. I was posted as Commander Military Engineer Services (CMES) Army at Peshawar. I was responsible for the army cantonments at Peshawar, Kohat, Bannu, D.I.Khan, Parachinar, Landikotal, Nowshera, Attock Fort, Chirat, Risalpur, Mardan, Durgai, Malakand and Malamjabba, and was in charge of construction and maintenance works. I was on deputation to the Pakistan Air Force (PAF) for three years as in charge of contracts and also dealt with audit objections. I have visited most of the Air Bases of PAF. I was seconded to Saudi Army for 1½ years, and served in Sharora, Najran, Khamish. There, I was also blessed with the opportunity to perform Hajj with my family. I served in FWO and NLC on the construction projects. Starting from KKH, Roads in Balochistan, and National Highway in Sindh, airport runway at Peshawar and Vehari and also as staff officer in FWO Headquarter at Rawalpindi. I retired as Lt Col in Jan 1996, after serving more than 26 years in army at the age of 50 years. I enjoyed the army service and it was the best period of my life. Every moment of my service is memorable, encountering new challenges all the time. It was always unique, bringing in new experiences on every posting and at every new station. The risks of life involved in KKH, mine breaching after the 1971 war and fighting the war of insurgency in Balochistan were some of the challenges I faced during the army life which I can never forget. Throughout my service I never compromised on training of troops and officers and tried to maintain it at highest level so that the fighting efficiency should remain at the top. I always inculcated the spirit of Jihad in them and made them aware that it is the deadliest weapon with them with which they can win the battle even being out numbered. I left the army with a very heavy heart. After retirement I joined for the construction of Kabirwala Power Plant, sponsored by Fuji Foundation which gives employment to retired army personnel for first five years so that they could adjust in civil setup more easily. I was in charge of civil works. Then I joined as Resident Engineer (RE) in Mera Ghar Scheme at Peshawar, a residential project launched by Prime Minister. The project came to an end in 1999. I then joined CWO on contract for three years as Deputy Director in Karachi. I then joined M/S AA Associate, a consulting engineering firm, as RE on their Darul-Uloom Road Project in Karachi. This is the main road passing through Korangi Industrial area to Dawood Chourangi. A 12 KM, 6 Lane Road with service roads, footpaths, RCC covered drains and service corridors on both sides. FWO was the Contractor. While in AA Associate, I was also appointed as coordinating officer on road project, sponsored by BYCO Oil Refinery, from Hawkebay to the Refinery near Hubco Power Plant along the sea. I worked in AA Associate for three years. I then joined M/s Lakeshore Engineering Services Inc. as Manager. A US based company, deployed in Pakistan for the construction of Cantonment for NAVY at Gharo Karachi. Presently, I am working in FWO as Deputy Project Manager for last two years, on their project Development of Phase 8 in DHA. Roads, Chambers, Sewerage System, Manholes and Utility Chambers are being constructed. Side by side some welfare work on small scale is also in progress. Always work hard with honesty, keep improving your professional knowledge, never compromise on the interest of Pakistan. I thanked Engr Javed Majid, for sharing with me his detail, life adventure. Though he is a saintly looking person, I never knew he was a Lieutenant Colonel and at the same time so humble.